Pick up any car magazine about cars older than ten years and you'll see that 'C' word, Classic. Alas there are many cars that barely qualified as cars when they were new. But magically and allegedly attain some cult status on crossing their tenth birthday. The 124 Spider needs no such help. The dictionary will define something 'classic' as having a timeless uniqueness, of enduring high status, held in universally high regard. And the 124 Spider deserves all of these accolades. The 124 front wing shape headlights and bonnet aperture have tended to make a wayward comparison with the MG ‘B’ common among anglophiles. But really the ‘B’ was technically and mechanically inferior – and a test drive in both would convince all but the hardened MG fan. As others have pointed out before me, no ‘B’ ever won the European Rally Championship either. Lastly I often browse Autoitalia Magazine when helping to compile these pages - and I can't resist the last Word going to Charis Whitcombe, "To me the 124 is far prettier than an Alfa Spider of the same era and it's a much better drive: far less scuttle shake, for one thing. And best of all, it's cheeper than a Naples prostitute. A recent admirer sighed, and said he'd love such a car but could never afford the insurance. My annual premium is £101.85." (Number 63 page 82). Perhaps the next time I'm off to Italy, Charis, you could give me a few pointers. The 124 Spiders were a long-lived marques in production terms. It doesn’t help that the later cars are quite different mechanically. This has made for some confusion amongst would-be owners. Firstly today’s letter designations come from the chassis and engine code numbers to be found on the Vehicle Identification Number and engine plates. You won’t necessarily find them referred to in the Fiat documentation of the time. 1) The 1966 to 1975 cars follow early Twin Cam development using the 124, 125 and 132 saloon engines and some of their running gear as these became available. 2) Post 1975 US specification cars with emissions control devices. 3) The fuel injected cars from 1978 onwards and including the Pininfarina made cars. Historically the engine chosen for the first series of 124AS was the 90bhp 1438cc unit – with pushrod engine block and twin cam cylinder head similar to the 124 saloon. The Spider was available in limited numbers across Europe during 1967, but in 1968/9 numbers leaving Fiat increased. The only mechanical changes made were to drop the torque tube transmission (successful in the 124AC Coupe) in favour of a propshaft. Late in 1969 (about chassis number 21000) the 110bhp 1608cc engine from the 125 series was introduced, alongside the smaller 1438cc engine option. Both engines have a free revving reputation. Later known as the 124BS this series has bonnet power bulges to accommodate its twin carbs. As with all the 124 series with this engine, a ‘1600’ badge is placed on one of the rear facing panels. Late in 1972 the 124CS was introduced taking advantage of the 1592cc and 1756cc engines from the132 saloon range. Unfortunately USA emissions regulations and the oil crisis affected this series. No twin carb. options were available and the planned road going variant of the 124 Spider Abarth was cancelled. That meant we were left with the 1000 made of the 124 Abarth Rally (Fiat figures of 1972-4 output) produced to homologate the car for FISA Group 4 rally competition. A minimum of 400 were demanded for Gp 4 homologation. And were batch produced at Abarth for two years from 1972 with special lightweight body panels, glass fibre boot and bonnet, minimal bumpers and alloy door skins and a fully independent rear suspension. The mandatory hard top was fitted with a perspex rear window and of course Abarth CD30 alloy wheels plus Recaro bucket seats. The 1800 engine had twin 44IDF carbs, the rear axle was fully independent with anti roll bar. Later a full performance package was available to take the 128bhp basic output to 170bhp. In later Rally variants Abarth produced a 16-valve head to help keep the world rally competition at bay. The 1975 124CS with its single carb. and somewhat strangled breathing was the last Spider to be sold in Europe via the main dealer network until the 1982 Spidereuropa. During this period the cars were only orderable direct from the factory with the American spec. (You can have any spec. you like so long as it’s US sir) Initially the 124CS ‘1800’ was rated at 118bhp. By 1977 the power output fell to 87bhp under US regulations. In 1978 the final series was introduced as the Spider 2000, with body styling bumper and interior changes. 8 months later fuel injection and automatic transmission were introduced as options. Although power output was increased to about 100bhp, the ride height was raised and the hydraulic bumpers weighed nearly the same as the car’s transmission! The 2000 spec. car with fuel injection, 8.2:1 compression, and high ratio final drive returns 35 mpg – but couldn’t rev. much beyond 5200rpm. Perhaps as a result of ‘customer pressure’, and with the agreement of Fiat Motors North America, Legend Industries (of New York State) were contracted to provide 1200 turbo conversions. The requirement was to comply with emissions regulations, maintaining fuel economy and generate about 125bhp. This was achieved, but did less than you might anticipate to the performance levels because of the weight side of the power to weight ratio! Converted cars were marketed as the Fiat Turbo Spider. Warner IHI of Japan were chosen to provide the turbo (already involved on the Uno Turbo project). It was a compact and lightweight turbo kit, though for the level of boost an intercooler was not considered necessary (and cuts down both kit and fitting costs). The standard Bosch L-Jetronic fuel injection was modified to enrich the mixture, and a Lambda sensor was added to the turbine housing output casing. The 124 Turbo package also included Cromadora 14in wheels plus coach work stripes and badges. In 1982 124 production was transferred to Pininfarina creating the Spider Azzura (named after the Italian Americas Cup entry of the year) in America and the Spidereuropa in Europe. Pininfarina had always produced the body shell and now made and distributed the whole car. (A similar arrangement occurred with Bertone and the X1/9 at this time). Fiat and Lancia were going through a rationalisation of their ranges and production facilities. Under Pininfarina’s production, European spec Spiders were available again. These new Pininfarina 124’s carry the prefix 124DS with engines rated at about 105bhp – the Europa being without the catalytic converter mandated in the States and consequently producing slightly more (3bhp) power. 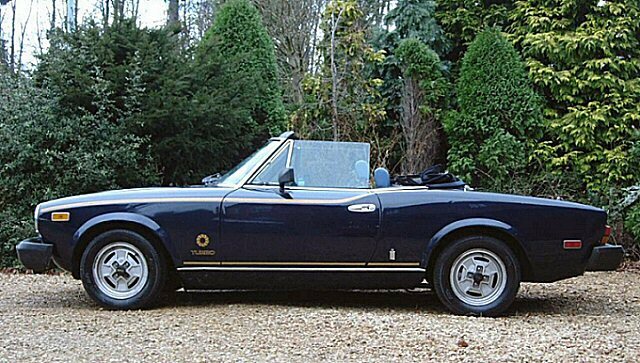 The final chapter of the 124 Spider is graced by the Spidereuropa Volumex. It used the Abarth inspired Volumex supercharger – Lancia had installed versions in the Trevi, Beta Coupe, HPE, and Fiat in the Argenta. This Roots type belt driven ‘positive displacement’ Volumex was developed specifically for the Twin Cam range with serious work undertaken latterly for the Fiat 131 Abarth 035 race cars. The low down instant torque of the Volumex suits these cars and Twin Cam road going applications well. After 12 months development, in 1983, manufacture began of the ‘Abarth Spidereuropa’. 500 cars were produced before Pininfarina ceased in 1985. The car is finished to very high standards with Bilstein gas shockers, Speedline 7j x15inch split rims, extended arch trims, ventilated discs and a top speed of 120mph. The Spidereuropa VX engine layout is typical of Abarth’s influence with coolant and air flows closely regulated to improve engine operation. The 2 litre engine was conservatively quoted at 135bhp and 1.4bar from the blower. It’s capable of a lot more. I’d like to know whether it was financial/cost, marketing/distribution or maintenance problems that caused Pininfarina to stop production. There should be more of these Spidereuropa VX’s in the world today! Only 500 of them were sold - 44 were painted black and the rest were ‘Abarth 124’ red. Perhaps Pininfarina couldn’t make the project profitable enough but in engineering terms the 124 evolution ended on a fittingly high note. Pre 1978 cars share similar body panels. Also most late panels can be adapted to fit earlier cars. But panel gaps and detailing may differ so retain the original to compare. Later bonnets were adapted to accommodate the taller engine blocks & carb. setups with two different sizes of twin ‘power bulges’. Front & Rear Wings are universal but differ in the indicator badge and repeater pressings. Europas had front wheel arch liners that can be adapted to fit earlier series. Front wings comprise 3 parts that need correct assembly – the wing, the abutted lower wing section and the headlight retaining ring. Front panels (below grill) differ according to the engine size - and the increase in under bonnet ventilation required. Chrome bumpers were fitted up to 1985. US cars had over riders as standard. Windscreen frame & scuttle removal is possible but can crack the glass. Spider wiper motors are unique but universal (we think). Door frame and skin – are available again. Retain the handles if possible as these can be expensive. Roof /Hoods – differ with the year of manufacture. Seek German or Italian made examples. German targa tops are available. Differentials – post ’78 rear axles can be a hybrid of 131 132 and 124 parts. Often the back axle has no alternative model to source. Diff units that might be ok to use include the 131 Sport or 131 1600T (latter’s ratios differ). They need to be well set up. Consider using a specialist (re: meshing and pre-loads). As an alternative consider using the earlier 124 axle with Panhard rod suspension mounts and its propshaft. In contrast the 124 saloon gearboxes are weaker - the later 132 & 131 units being much the stronger. Change the gearbox oil regularly (at every engine oil change) and tackle leaks quickly. Fiat recommend Olio ZC90, but club members have also used good SAE 20/50 engine oil. Gearbox swaps - All the 124 5 speed units (124 Special T) all Coupes 125s and early 132s are interchangeable (though ratios differ!). Later boxes (131&132) have longer tailshafts and different lever positions. Clutch cables – are sensitive to heat drying them out in the engine bay, or to misalignment at the bulkhead causing chafing. Take note of where the inner cable failed by removing the shorter side inner up to the breakage point. Lubricate the new cable by running clean engine oil through for a day and protect the outer with a heat repellant hose around the hot spots. If the cable snapped at the bulkhead do not assume it was a ‘normal wear’ event. It’s possible for the pedal box or pedal action to have always been mis-aligned or the top pedal fork to become bent - and no-one do anything about it. It’s difficult to change the bulkhead cable retainer position or the clutch pedal’s action and easier to fit a new cable! The pedal action must pull the inner cable back along it’s central plane. It’s difficult to check visually from the footwell so persist (use mirror to check action?). Insert thick washers in pedal spring to expand it prior to re-assembly. LHD steering boxes are expensive at £450. RHD conversions using the 124 Coupe steering box are possible. Late cars had rack and pinion which helps. From 1978 cars also had rhd chassis mounting holes to assist alignment. The Instrument section and glove box can be reversed and Coupe parts used for the controls. The main cost of conversion is in the professional time involved and is unlikely to be reflected in today’s resale value. Exhaust systems including stainless steel are available. For later ‘Cat’ cars If the entire system is being replaced try the European 1800 system (with a 4 stud manifold) in the post ’78 cars if you have the chance. The boxes may need rotation until the right position is found anyway. (Advise use of professional garage car hoist). Water (coolant) levels should be checked regularly. The water level and colour will often give early warning of gasket problems. A low coolant level can quickly cause a head gasket blow on the Twin Cam engines. A 124 spider should be on your shortlist if you are looking for a classic sports car. They are well engineered, have the Italian ‘brio’ and technical sophistication to provide reliable top down motoring. They even stand comparison with today’s soft tops although lack some of the economy, taughtness of ride and flexibility of the modern breed. As ever reliability in a twenty year old car will be bought by your investment. It comes with a price tag in time and money. In some respects the Euro spec 124CS 1800 or the BS 1600 fit the image of the classic sports car best. The Twin Cam engine was unrestricted, and responsive in its purest form, the bumpers were chrome and development had ironed out early foibles. Prices are higher for an equivalent standard 2000 or Europa. The build quality of the later Pininfarina produced cars is generally good too. Special editions and the Spidereuropa Volumex command a premium, with the rare124 Abarth commanding the highest prices of all. Four issues keep Spider prices down here. They were all originally left hand drive, they were never officially promoted in the UK, thirdly knowledge and support for the cars was limited (except for clubs like SFC/FTCR). Fourthly imports have been restored with a wide range of success so the spider reputation is blanketed with the 1970’s Fiat’s own ‘3 Rs’ for Rust, non-Reliability, and Random electrics. Putting significant mileage on one of these cars comes at a price. My first advice for buying is to look and listen to the owner. Avoid the low budget owner who keeps an indifferent example occasionally scraped through an MoT by bodges. A ‘rolling restoration’ view is needed from both owner and purchaser. The problem here is that professional restoration costs can quickly exceed car value. What has the current owner’s approach been to this issue? What is the motive for ownership? The shell is paramount. Body panels are available, but does it sit level, and drive straight with no sagging at the sills and no clonks or whines? Take along expert advice. A car with shiny panels but rust lifting paint along its underside seams is probably no more than three years away from MoT failure and re build. Check door operation panel gaps and locks for signs of sag cracking & filler. LHD steering boxes are expensive. Check straight ahead drive feel and radius arms/ track joints. Car shouldn’t feel vague. Differentials – post ’78 rear axles can be a unique hybrid examine with care. Often the back axle has no alternative model to swap so check for wear. Diffs also need to be well set up (re: meshing and pre loads) check for whine & backlash. Twin Cam engines are reliable providing they are regularly serviced and oil changed. Check the colour of the cam visible under the filler cap.for brown deposits. TC’s were prone to head gasket leaks, often because the coolant levels were allowed to fall too low. Check for gasket blow and external leaks (oil or water). Listen for fan starting and stopping in short bursts on tickover after warm up. Check for gasket oil leaks on the cam covers especially on the exhaust manifold side where they dry out. Check heater operation, when warm check for leaks & stains under dash. Expect low engine oil pressure on tickover but it should rise with revs. About 20psi at 2500 rpm is ok rising to 40 psi at full revs. Engine should not smoke or leak or ‘tick’ from its valves. Carbs need re building every 80k miles – like any other carb! The loom and earth points are a potential problem. Check how these have been tackled- are they bodged? AS rear lights and lenses are rare and expensive check for cracks. There has seldom been a better time to find high quality spares for the 124 Spiders - mainly due to continuing popularity in Germany. It is also a good time to look at buying in the States with favourable exchange rates. But the only reason to consider importing is to obtain a good body. It’s certainly true that the popularity of the Barchetta has dented demand in recent years. Even the youngest of the spider models is now over 20 years old. So use the table below to help budget your re-build. Can you find better value from a well-restored and cherished 124 already over here? These prices suggest that the gearbox and body must be at the top of your ‘hit’ list. Bodywork prices assume you’ve paid more for a good donor! These prices assume you can have the work done and source parts somewhere in the UK outside the South East. In the South East you might need to add another 25% to these prices. The moral should be clear! Can I find a Right Hand Drive 124 Spider? Fiat never made right hand drive models because they didn’t intend it to be an official UK import. The conversion is not technically difficult – using readily available Fiat components. But it is time consuming, and therefore expensive to have the work done professionally. Many have been converted and the good news is that re-sale prices should be higher. Another bonus to the conversion is that re positioning of components like the brake servo allows side draught carbs to be installed on the otherwise too crowded inlet side of the engine. I’d like more power, where can I buy a 124 Abarth? Very few homologation 124 Abarths are in the UK (currently we know of 12 - including replicas). Its power output was rated at 128bhp although there was a 170bhp kit to bring it to basic rally/road spec. It is a unique ride though, being stiff and noisy. If you just want more power you could uprate a standard one. But they will always be a very noisy drive once the twin cam’s induction and exhaust is tuned. Try one of our member’s converted 124s before you decide. Was a turbo 124 ever produced? US tuner Legend Industries did produce a turbo version of the Spider 2000, but it didn’t have an intercooler and, with US emissions, power output was quoted at 125bhp. The best forced-induction solution must surely be the Spidereuropa Volumex version. This includes a 135bhp supercharged motor – with everything else mechanical uprated to cope. The big twin cams always responded well to Abarth’s supercharger and it gives loads of torque. I find all the types of 124 very confusing! It’s best to think of 124 Spiders in three groups by their registration date; Pre 75, Post 75 US imports, and Fuel injected from 78 on…. Pre 75 from 69 you’ll mostly find 1608cc series 2 (BS) or 1756cc series three (CS). The age of these cars makes it essential to check out the body shell. It really has to be professionally done. The early European cars give a good responsive drive. Drive train, especially the diff. and box are more fragile though. Post 75 US imports make a good basis for restoration, if the body shell is good enough. Later (Post 78) injection models are more civilised, more comfortable with better trim and equipment, but all this comes at a price premium! Expect very soft ride and handling. Can I easily get parts for these cars? Yes, the availability of parts for the 124 has never been better. High quality reproductions are now on offer – mainly through German enthusiasm for the marque who claim several thousand 124s still on the road. So most of the current sources are on the continent. You can readily find knowledgeable local garages and good UK suppliers too. See the page links below. • That's an interesting idea on coil over conversion kits for the 124 Spider from Rob Copeland! • Spider-Point have established a good reputation for advice and high quality parts. Obtain a copy of their catalogue for the 124 Spider from the Spider Point Site . TopDrive Gmbh - the company that runs Spider-Point also has a weekly chat if your German's up to it.